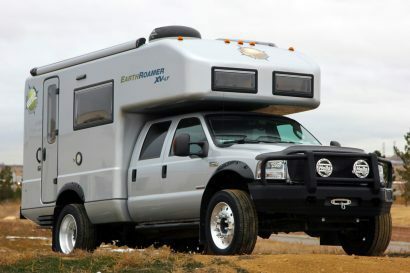 GM hasn’t always been the first name that comes to mind when you think about an overland vehicle. However, this is quickly changing with the introduction of the Bison and now the newly introduced AT4. 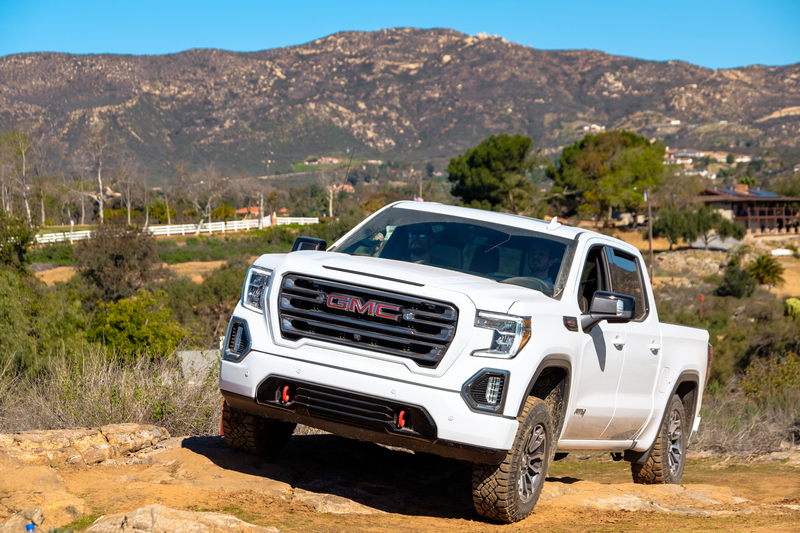 To find out about this newest offering, I hopped on a flight to San Diego, California, to put their new Sierra 1500 through its paces on a few mountain trails. 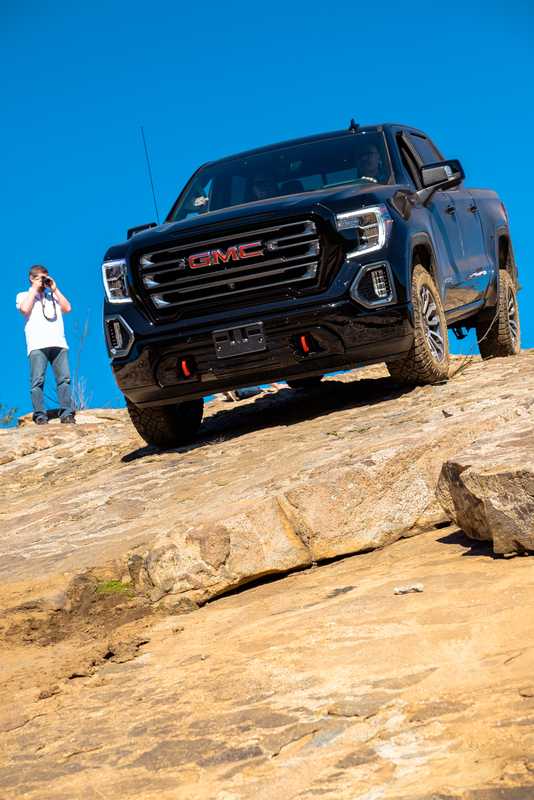 The AT4 package is an all-new off-road centric trim level that is being applied to several of GMC’s more popular platforms. 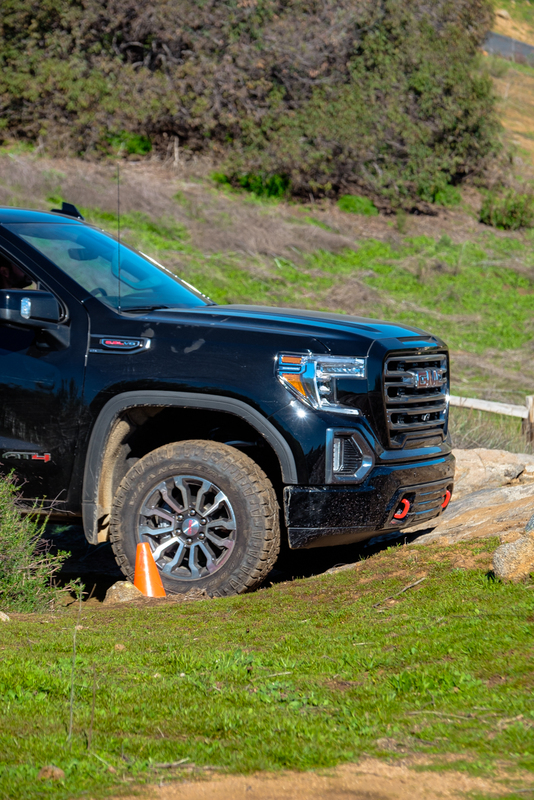 The Sierra 1500 that I tested here was first, but it was followed up by the recent reveal of the AT4 HD, and rumor has it that other SUVs are soon to follow. Now you’re probably wondering what this truck is supposed to compete against in the marketplace. 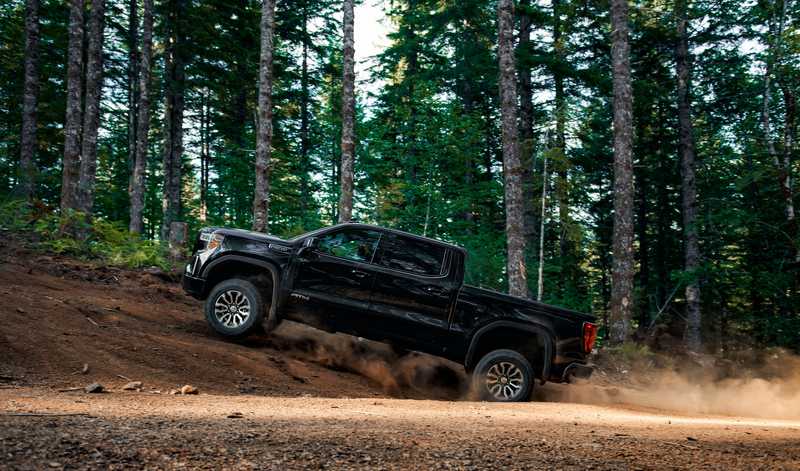 It is a shot across the bow of options like the Tundra TRD Pro, RAM Rebel, and Nissan Pro-4X—trucks with a mild lift, rugged looks, and some improvements in capability off pavement. So what does the AT4 package include? Starting from the ground up, it lifts the Sierra 2 inches with an upgraded GM spring package and application-tuned Rancho shocks. 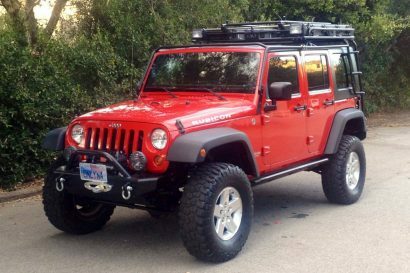 The standard all-season tires are replaced with 275/65R18 Goodyear Wrangler DuraTracs wrapped around aluminum 18-inch wheels. Buyers will find additional skid plates installed on the undercarriage to protect the oil pan, differential case, and transfer case which is critical given the wheelbase and breakover angle. It is equipped with an Eaton automatic locking rear differential, hill-descent control, and a 2-speed AutoTrac transfer case with low-range. Then things start to get a little more high-tech. The AT4 comes with an all-new Traction-Select system, which can toggle between preset drive modes to tailor transmission shift points, throttle mapping, and the StabiliTrak and traction control systems for optimal performance in any terrain or situation. A 15-inch diagonal head-up color display shows you information including speed, navigation, off-road inclinometer, and front tire angle. 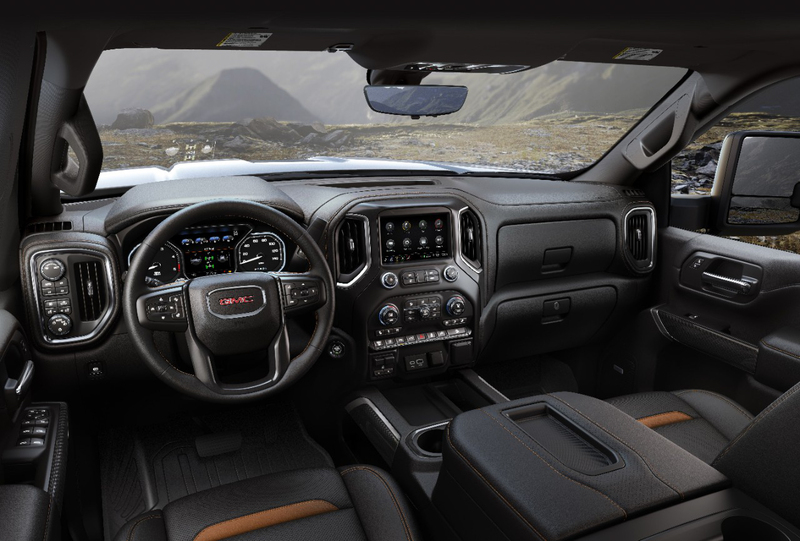 The optional 8-inch infotainment screen will also display the truck’s Surround Vision feed, which gives the driver a myriad of angles from which to view the truck and its surroundings, thanks to several integrated cameras. This is not only useful in daily driving and towing, but allows drivers to self-spot on the trail. For those paying attention, you might be thinking doesn’t Chevrolet’s Silverado Trail Boss come with many of these options? The answer is yes, it absolutely does. Both can be equipped with Rancho shocks, a 2” lift, and Traction-Select systems, however the AT4 has a few the tricks up its sleeve that just aren’t available on its cheaper sibling. Most notably, it can be purchased with an optional 6.2L V8, which pumps out a thrilling 420 horsepower and 460 pound-feet of torque. This gives the AT4 serious towing capability and power, plus an undeniable edge on the optional 5.3L V8 in the Chevrolet. Of course the AT4 also receives a unique interior, special exterior accents, and some very bright red tow hooks to set the aesthetic apart, but we were far more interested in this truck’s handling, and we received our first taste on the tight curves of a California byway. Although the AT4 comes standard with that 5.3L V8 producing 355 horsepower and 383 pound-feet of torque, our 2019 was unsurprisingly equipped with the 6.2L V8 we mentioned earlier to showcase its strengths. With the pedal to the floor, this motor will push you back in your seat and leave you obsessed with the unreal soundtrack of the cat-back performance exhaust. I found it impossible to resist the urge to roll heavily into the throttle as we rounded tight bends or accelerated down on-ramps. The 10-speed automatic transmission shifts smoothly on the highway and feels well-matched with the big V8, but I did feel like it sometimes changed gears a little too quickly under medium throttle input, especially when starting from a light. Fuel economy from the 6.2L is a respectable 15 city/19 highway, which is better than it has any right to be thanks to the Dynamic Fuel Management system. This allows the engine to use up to 17 different patterns between two and eight cylinders to balance power with consumption. Since we’re comparing this truck to the Tundra, Rebel, and Titan, they’re fetching fuel economy figures of 13 city/17 highway, 15 city/21 highway and 15 city/20 highway respectively, so the AT4 splits the pack but with the most horsepower and torque. I’m happy to report an inline 6-cylinder 3.0L Duramax turbo-diesel will be available soon though, which will almost certainly give this truck an efficient twist. 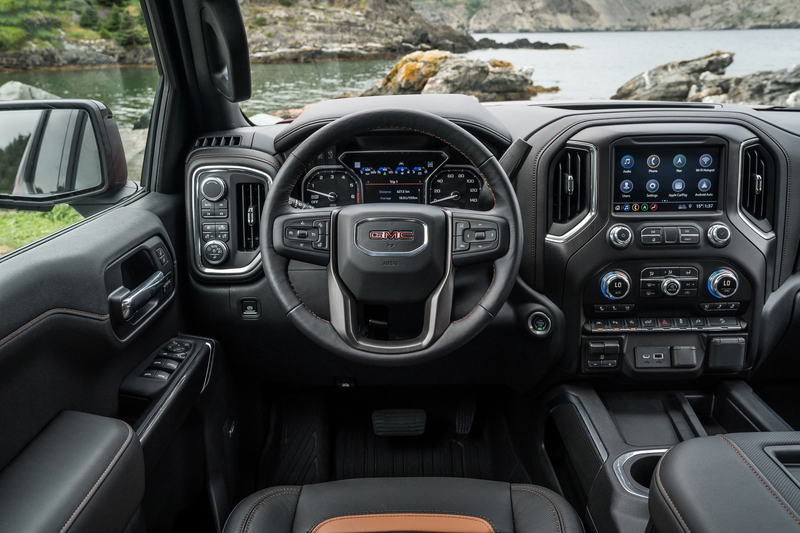 As you’d expect from GMC, on-road comfort is exceptional thanks to a wealth of creature comforts like heavy sound deadening, a heated, leather-wrapped steering wheel, and heated and air-conditioned seats so wide they almost need marker lights. The infotainment system equipped with Apple CarPlay and Android Auto will keep you entertained on the go, while crystal clear music plays through the Bose premium sound system. The head-up display (HUD) projects your current speed and relevant information on the windshield in front of you including navigation, cruise control information, and general warnings and updates. Payload is rated at 1,710 pounds, which is 150 more than the TRD Pro Tundra, 100 more than the Titan, and identical to the RAM Rebel. 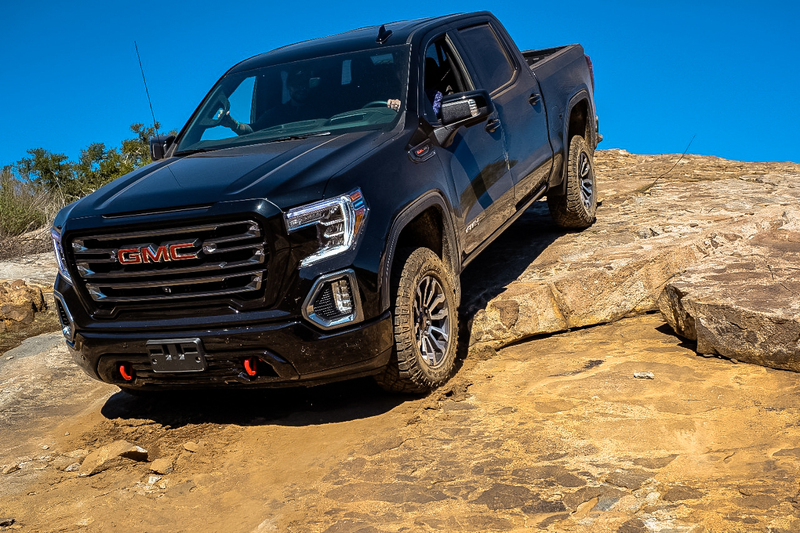 As I mentioned in a previous article on the AT4 HD, GM’s goal was to never sacrifice towing capability in any of their truck packages, which is why the AT4’s capacity remains a respectable 9,400 pounds despite its off-road upgrades. Unfortunately, this falls short of Tundra TRD Pro’s 9,800 pound capacity, and well short of Rebel’s 11,470 pound capacity. It does make up for that loss with an impressive trailering camera system though, which features a wide array of guidance, camera angles, and assist features you can learn all about in this video below. The last thing I want to mention about the AT4 before we get to off-road performance is the Multi-Pro tailgate. I know, really, a tailgate? But hear me out. GM’s marketing for the new Sierra has been ALL about this thing, and as much as it pains me to admit it, I understand why. It packs an array of different functions, giving owners several advantages over ye ol’ tailgate your grandfather used back on the farm. First, you get a work surface, which is elevated to roughly bar table height. It’s perfect for taking notes, looking at maps, prepping fishing gear, or setting down your beer during a tailgate or campout. The next stage is the standard drop-down tailgate, but it features another drop-down level that reveals a full-width step for access to the bed. I found this rather handy for a truck lifted 2 inches already from the factory. 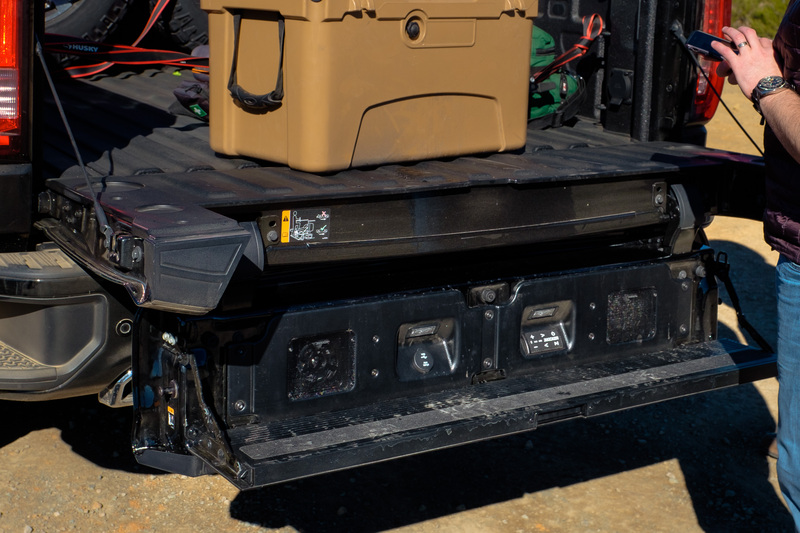 Then there’s the load stop, which is designed for hauling cargo longer than the standard bed without letting it hang out the back unprotected. On the surface, this seems pretty handy, but I question how often I would encounter a load that is just long enough to not fit in the bed, but shorter than the spread to the load stop. I might be crazy, but it feels oddly specific. There is also the Easy Access mode, which I love. It allows you to drop the center portion of the tailgate all the way down, enabling you to reach further into the bed without leaning way over the tailgate. Back. Saver. 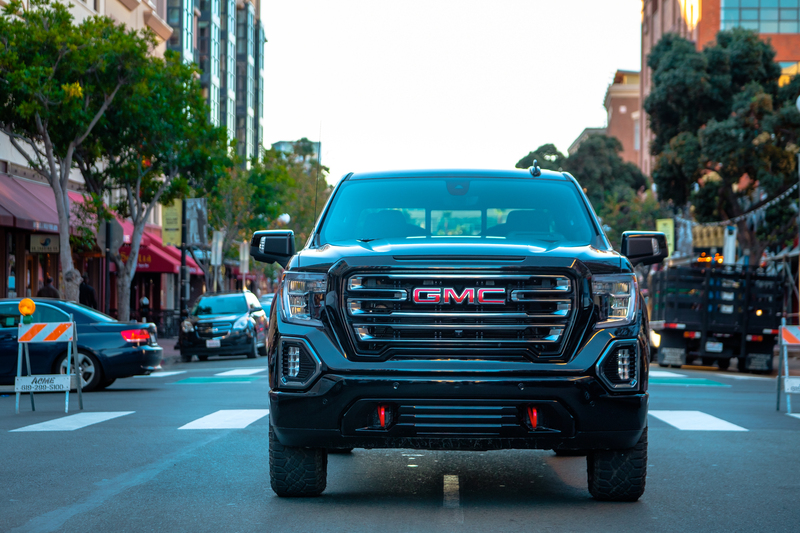 GMC had one last trick up their sleeve with this tailgate, a water and dirt-proof 100-watt kicker audio system with two 4” coaxial drivers, a compact amplifier, and an easy to use control board. This can be utilized with the built in USB port for playback and charging, or via Bluetooth giving you more mobility. So yeah, the Multi-Pro Tailgate has some useful features, as well as some less useful ones, and you’re right, it isn’t necessary, but let’s be real for a moment. We’re in an industry that buys titanium chopsticks and sleeps in canvas tents bolted to the roofs of trucks with refrigerators in them. WE LIKE GEAR, and once you’ve used this tailgate, you’ll realize it is not only cool, but convenient as well. Is the Sierra 1500 AT4 actually capable of going off-road, or is it just an appearance package for those who want to look adventurous? Let’s dive right in. The dirt portion of the drive started on a narrow and winding mountain track. It was rocky, rutted, and steep, which gave us a chance to evaluate the vehicle’s gearing and suspension. Right off the bat, I felt pleased with the 3.23:1 gear pairing to the 6.2L V8. It felt great carving around the hillsides, propelling the truck forward without bogging down or feeling like it would overheat the transmission during extended use. After a brief break at the summit, we began the descent of the other side of the mountain. On normal declines the engine braking felt sufficient to hold our speed, but when the route became steeper, the truck began to overrun the gears. This necessitated either riding the brakes or putting it in 4-low. I chose the latter, which worked beautifully. Even with the tires at a street pressure over 40 PSI, the ride felt smooth and comfortable. The Ranchos soaked up most bumps with ease with very little chatter on the washboards. Only when combining heavy throttle or quick steering inputs on corrugations would the vehicle begin to break loose, and that is to be expected. 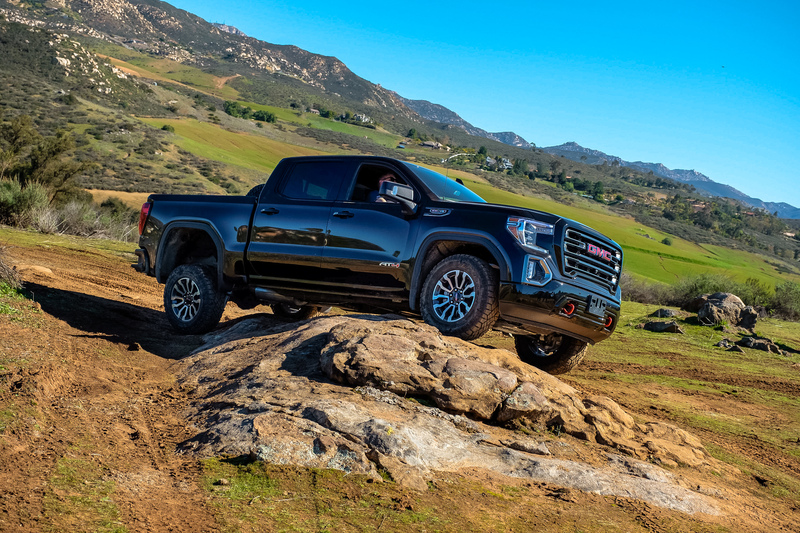 Despite the 147.53-inch wheelbase on our crew cab test platform, the Sierra felt maneuverable if not agile through the bends. I think this had a lot to do with the favorable visibility, as well as the easy steering responses of the truck. When combined with the softer suspension preventing us from bouncing around in the cab, I would describe the driving experience as confidence inspiring. The funny thing about confidence though, it can sometimes come back to bite you, and the technical terrain still lay ahead. 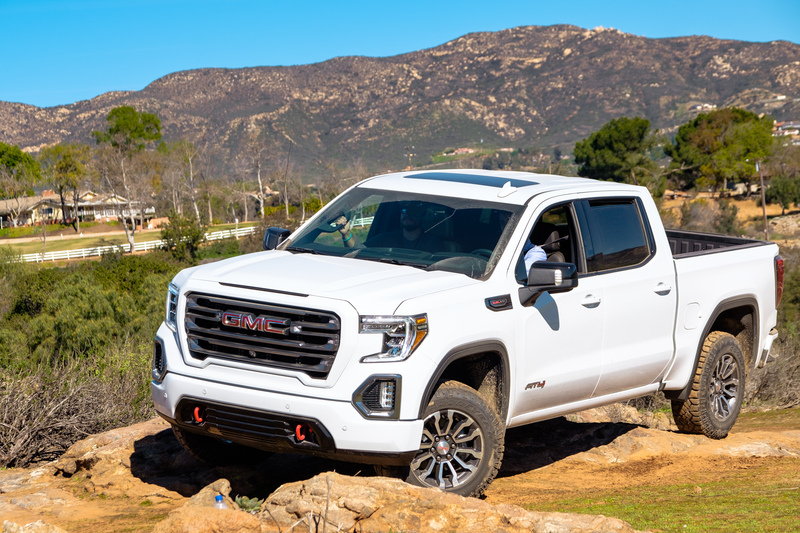 Although on our last GM launch in the Bison we were able to open the trucks up on unaltered desert trails (you can read about that here), GM had set up an afternoon course on a nearby ranch instead. To their credit, the original more difficult trails they had selected were closed due to the government shutdown, so they did what they could with the short amount of time. The new test track consisted of an initial off-camber hill climb with nearly 20 degrees of tilt, an articulation section over some rocks, an approach and breakover angle test, and finally a descent back down a different portion of the rock face we began on. All of it was natural, and none of it had been dug out or groomed for the trucks. As before, everything was driven at factory air pressure. The climb up the first off-camber obstacle was slick with loose rock and dirt, so I let the AT4 cruise up slowly then stopped to see how it handled the low-traction situation. Although the tilt was fairly aggressive, the AT4’s Duratracs held firm to the surface, and the traction select system countered any slipping that occurred. Others who took the obstacle faster found the Eaton locker would engage, which solidified their forward progress and maintained momentum. I want to make a note on the Eaton automatic locking differential: Traditionally, I haven’t been a fan of this style unit because they require a significant differential of wheel spin to activate. This is fine in sand, snow, or mud, but in technical terrain, it requires too much throttle input for smooth and safe vehicle operations. Long-time readers may recall I experienced this issue in the Z71 Colorado in New Mexico, but I’m happy to report I never did in the AT4. In almost every scenario the traction control system was able to maintain forward progress up to the point where the locker would engage, producing a rather effective combination. I would still prefer to see a manually engage-able electronic locker, as you’d find in the RAM Rebel and Titan Pro-4X, but this is certainly better than nothing. For those curious, the AT4’s magic number for locker engagement is a wheel spin differential of 100 RPM. On the articulation section of the course, I took a moment to inspect the HUD which had been actively feeding me information relating to the vehicle throughout the drive. In 4-low it now displayed data such as front to back and side-to-side tilt, as well as front tire angle. In most situations, this stuff feels a little gimmicky, but I did find the tire angle was a useful addition for slow technical terrain, and the tilt could be handy for avoiding rollovers, although I suspect its primary use will be for bragging rights to your buddies. What wasn’t even slightly gimmicky though were the cameras. When working through the rocks or cresting a ledge where the hood blocked the trail ahead, the AT4’s Surround Vision system gave us a clear, unobstructed view of everything before us. Not only that, its guidance lines provided a preview of where the vehicle would go based on the current steering inputs, allowing us to self-spot our way through the course. I cannot overstate how helpful this was in the test, or how useful it would be while traveling solo. 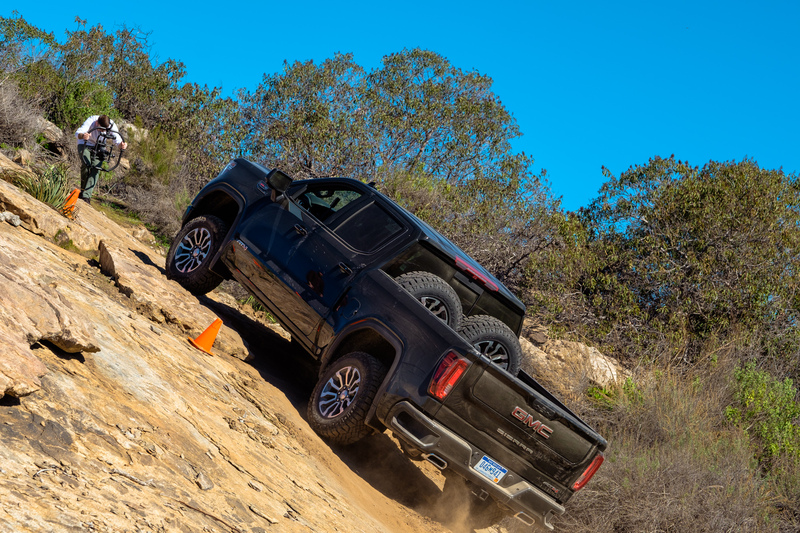 As we worked through the crux of the course, I noted that the 10.88 inches of ground clearance was enough to keep the truck from striking any of the skid plates or other components on the rocks by a good margin. That is to be expected though, as the AT4 packs more ground clearance than the RAM Rebel, TRD Pro Tundra, or Nissan Titan Pro-4X. The articulation seemed adequate as the truck never lifted a wheel or seemed to lose traction throughout the course, but I will pair that with the caveat that there wasn’t really a chance to cross things up enough to see how far the AT4 would flex. Hopefully, there will be a chance for a more comprehensive test in the future. We apologize for repeating the lead photo here. What was apparent on the other hand was the lack of torsional flex in the body. There wasn’t any discernible twisting through the truck thanks to the fully-boxed frame, a factor which makes the Sierra an increasingly rare breed these days. The biggest downfall of this truck is its approach angle, a mere 25.8 degrees thanks to the front fascia, which barely cleared the entry to one of the obstacles. It’s still better than the Titan Pro-4X’s 22.8 degrees, but falls short of Rebel’s 26.7 degrees, and far short of Tundra TRD Pro’s 31 degrees. This came as no surprise, as the same lower fascia was a major issue for the Z71 Colorado I tested in New Mexico. On that truck, you could simply unbolt the lower air dam to improve clearance dramatically, and I suspect the same will be possible on the AT4. Unfortunately, I did not have the chance to crawl underneath to find out for sure. Breakover comes in at 20.4 degrees, just slightly lower than the Titan Pro-4X’s 21.7-degree breakover, and Rebel’s 21.8. Sadly, Toyota hasn’t listed an official number for the Tundra TRD Pro, so we’re in the dark there. 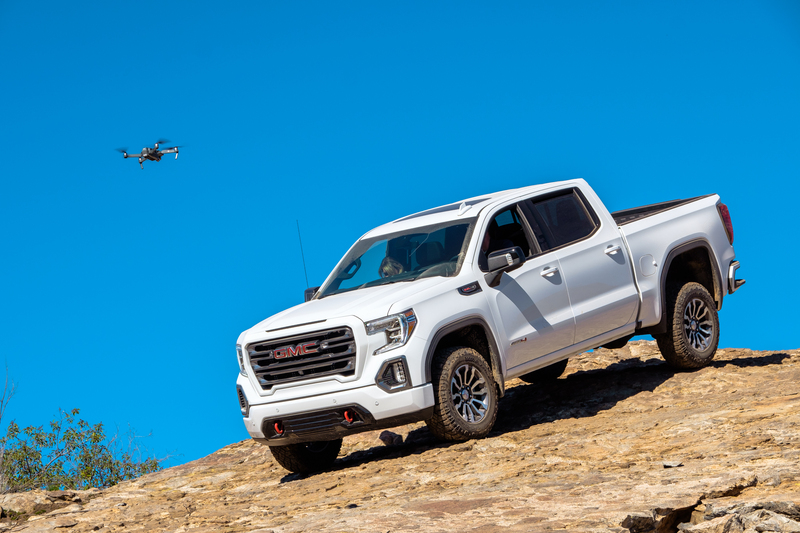 On the upside, we do know the departure angles for all three trucks, and the AT4 takes home the bacon with 27.2 degrees, a full 10.2 degrees better than the TRD Pro Tundra’s 17 degrees, 3.4 degrees better than Rebel’s 23.8, and just a hair better than the Titan’s 26.8 degrees. Surprisingly, the AT4 is even better than the 4Runner TRD Pro’s 26-degree departure angle. Not bad, GMC, not bad at all. With the hardest parts of the course behind us, we lined the AT4 up for the final task, descending another slick rock face, but this time with a nice ledge to throw in some excitement. For this obstacle, I finally engaged the Hill Descent Control, which worked flawlessly without heavy bumping or any of the crazy noises that make you wonder what components are grinding to bits beneath your truck. It breezed through the descent, cleared the departure, and left me feeling satisfied with its performance. There was no denying it, the AT4 did better than I had hoped. 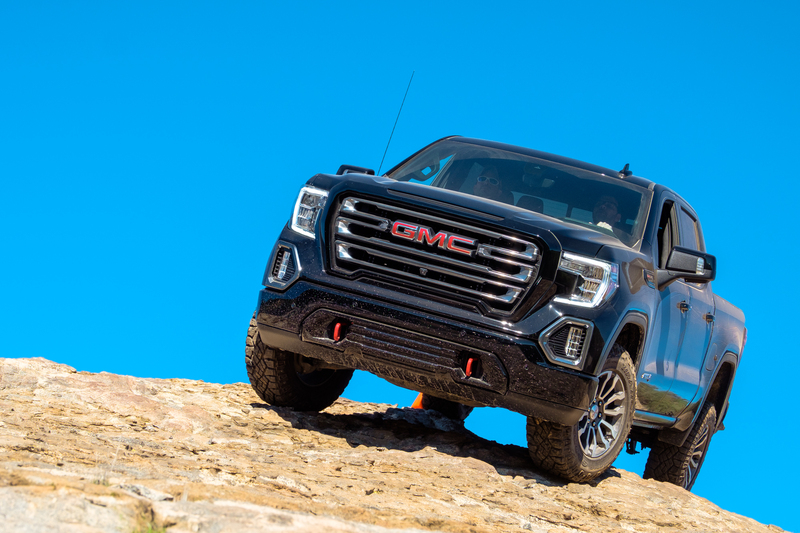 After a full day on the trail, I can say with confidence that the GMC Sierra 1500 AT4 is far more than just rugged looks slapped on a luxury pickup. Thanks to the improved clearance from the 2-inch lift, Rancho suspension, skid plates, and the Traction Select system with rear locker, it can hold its own off-road. The approach, departure, and breakover are all more than respectable, and ground clearance is a shade better than its competition, but that doesn’t necessarily mean it’s the right choice for everyone. The AT4 is going to be a perfect fit for people looking for additional payload and towing capacity with a touch of luxury, that still want to tackle trails like Mojave Road or the Alpine Loop. It’s extremely comfortable, easy to drive, and with a diesel on the way, it will certainly be one of the more efficient options on the market. 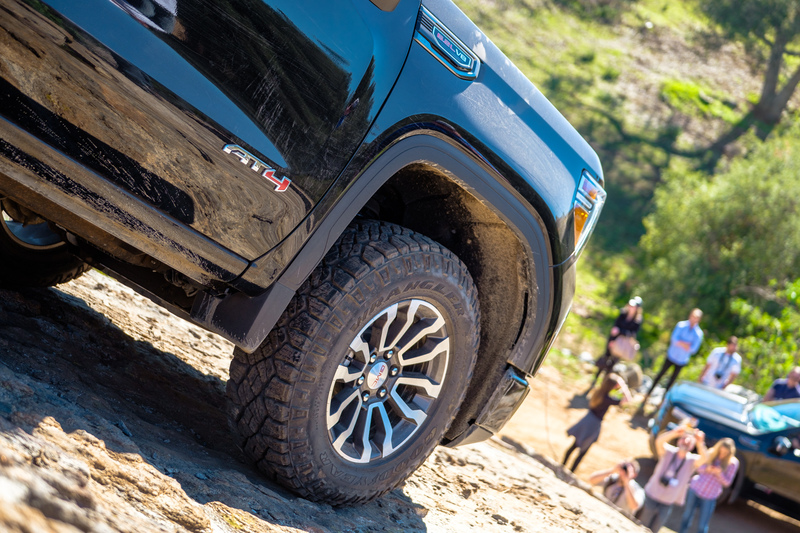 With a few changes like removing the lower air dam, upgrading tire size, and possibly adding sliders, the AT4 could be a seriously capable truck. Heck, you could even bolt on Icon’s new suspension for the Chevy 1500, but there is a catch, or at least everyone will say there is. With a starting price of $50,800, the comment sections are sure to flood with outrage over this outlandishly expensive truck. I’ll grant you, the AT4 isn’t cheap, but neither is the competition. Just look at the TRD Pro Tundra. Its base price comes in at $49,645, practically a rounding error of difference when you’re talking about a vehicle in this price range. The Titan’s entry point of $47,656 might seem a little better at first glance, but that comes with cloth seats. Add leather, and you’re forking out $52,995. RAM Rebel is in the same boat, stickering at $49,830 when equipped with the V8 and cloth/vinyl seats, so each of these trucks are nearly identical on the price and features front. The real difference then comes in the options, and boy, does GM have options. While the competitors can pick up a few grand here and there with additional niceties, the AT4 can be loaded up with larger engines, fancy interior features, electronics, and just about everything short of a butler to wipe smudges off your windshield. You could probably even negotiate that into the purchase. When all is said and done, you can have an AT4 like our test model loaded to the nines for a whopping $66,140, and that’s a lot of cheddar no matter how you slice it. Fortunately for those of us who can’t pull off that kind of payment, you can still order a base model with all of the V8 powered, leather seated, off-roady goodness for the same price as the Pro-4X, Rebel, or TRD Pro, and that is going to make for a tough purchase decision for many buyers. At the end of the day the Sierra 1500 AT4 has proven that GMC can make a serious off-road truck for a competitive price. It is a clear shot across the bow for other manufacturers, and yet another surprising release from GM in the off-road segment. While I won’t say that it is better than the Rebel, TRD Pro, or Pro-4X, it is certainly a contender for the crown, and that is going to make some serious waves in the full-size space. To learn more about the AT4, check it out on GMC’s website here.